I'm having such a lovely time at Alice's workshops. 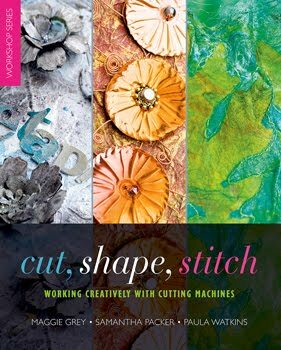 She has introduced us to the most wonderful techniques for Eco printing and mark making with natural materials. Alice makes the most beautiful little concertina books and bound books with delicate marks which Mother Nature supplies and Alice coaxes onto their pages. She has shown us how to make these little books. These are some of Alice's books. We have used rust and plant materials to colour fabric and paper. We made little parcels of paper and fabric and wrapped them around metal and leaves and onion skins. We then submerged them for a couple of days in one of Alice's cocktails to let the rust bring out the colours and marks. She kept us so busy doing other things but we really just couldn't wait to see how they were going to turn out! It rained hard for two whole days! We happily stayed indoors and played with new techniques with plants and rust. We printed with leaves onto fabric and paper. We did weaving and stitching with grass and lavender, we stitched around found objects. On this sample, the seed heads and feather were 'stitched' into the scrim using the object to make the stitch. I added a just few real stitches to hold them there. I have made a sketchbook to store all my samples. I love the shadows that are made on the paper. This is a close up of the feather and the wood curl. The seed heads were woven through the scrim and then over woven with stitch. Look at the shadows! This is one of the leaf prints on silk organza. I decided to layer it onto rusted fabric and then stitched around the leaves with some seed stitches. This is another leaf print with lavender. I have started stitching it to some rusted fabric and have collaged it with some other fabrics and some of my found objects. These are some more of my objects that have been partly hidden beneath net and sheer fabrics and enhanced with stitch. The limpet shell has been stitched on and the threads have been needle woven. Day 3! We finally opened the book parcels today! It was so lovely to sit in the sunshine after days of rain and open our little surprise parcels. Look at how time has transformed them! I've just popped over from Sandie's - your seed heads threaded through the scrim are just lovely, and it must have been so exciting opening those parcels! Thanks for popping over Alexa. It was so exciting! We didn't know what to expect and it was lucky that Alice kept us busy so we didn't have time to peek. Wow, I would love to go on that workshop, it's just up my street. Absolutely fabulous work, love all your samples. Must buy her book now. i recognise those seedheads - i have a feeling i gave them to alice when i was on her workshop at AVG in 2014!